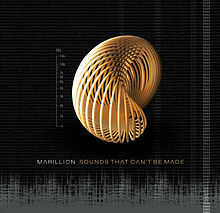 Sounds That Can’t Be Made is Marillion’s seventeenth studio album as well as being their first album of all new material since 2008s Happiness Is The Road. The band’s current lineup has been intact since 1989s Season’s End, the first album where singer Steve Hogarth came aboard on. What Hogarth, along with guitarist Steven Rothery, keyboardist Mark Kelly, bassist Peter Trewavas and drummer Ian Mosley have done is once again raise their bar even higher and the result is quite a satisfying experience from the listener point of view. The album begins with a sprawling seventeen minute plus track entitled “Gaza”. Now one would think this may not work at grabbing the listener’s attention by starting off with such a lengthy song right? How wrong can one be. “Gaza” is a song that takes you on a musical journey. It starts off slow and has several tempo and mood changes and before you know it the song is over. The song captures you and reels you right in. “Gaza” is also a political song that gives you a view how life is growing up in the Gaza Strip. The band has shied away from trying to make hit singles several years ago. They tend to let the music come naturally as opposing to trying to write catchy hooks. One listen to powerful songs such as “Pour My Love”, “Power” and “Invisible Ink” will show you how this band continues to grow even this late into their career. Sounds That Can’t Be Made is one of their strongest efforts perhaps their finest since 1995s Afraid Of Sunlight. The band has delivered one of their more memorable albums that will easily gain them some new fans as well as satisfy the ones who have been along for the journey.